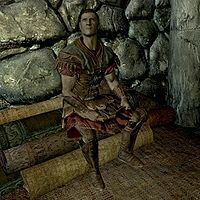 The Imperial Deserter is an Imperial soldier found in Redwater Den in one of the booths set up for enjoying Redwater Skooma. He wears a set of light Imperial soldier armor with no helmet, and carries an Imperial shield and belted tunic. If you approach him, he'll recognize you from Helgen and try to justify his actions: "Wha- who... you're that one from Helgen. Barely made it out of there myself. I hurt my back and I- I just need something for the pain." After the Bloodstone Chalice is filled during the quest of the same name, he along with the other addicts will be found dead when exiting the caverns. This page was last modified on 23 April 2013, at 16:55.